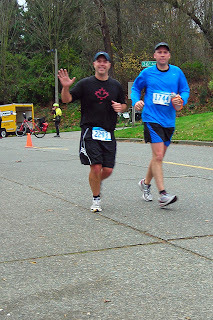 Yesterday was the something something annual running of the Seattle Marathon. Melony rode and I ran the 15 miles over to Leshi and back to get this photo of my buddy Joe passing the mile 18 mark. My only advice: Joe next time save the basketball shorts for the court, a marathon is a running race not a pick up game.